One of the first steps in an evidence-centered design (ECD) approach to assessment development is a domain analysis. If you work in credentialing, licensure, or workplace assessment, you might accomplish this step with a job task analysis (JTA) study. A JTA study gathers examples of tasks that potentially relate to a specific job. These tasks are typically harvested from existing literature or observations, reviewed by subject matter experts (SMEs), and rated by practitioners or other stakeholder groups across relevant dimensions (e.g., applicability to the job, frequency of the task). The JTA results are often used later to determine the content areas, cognitive processes, and weights that will be on the test blueprint. Questionmark has tools for authoring and delivering JTA items, as well as some limited analysis tools for basic response frequency distributions. But if we are conducting a JTA study, we need to start at the beginning: how do we write task statements? One of my favorite sources on the subject is Mark Raymond and Sandra Neustel’s chapter, “Determining the Content of Credentialing Examinations,” in The Handbook of Test Development. The chapter provides information on how to organize a JTA study, how to write tasks, how to analyze the results, and how to use the results to build a test blueprint. The chapter is well-written, and easy to understand. It provides enough detail to make it useful without being too dense. If you are conducting a JTA study, I highly recommend checking out this chapter. Raymond and Neustel explain that a task statement can refer to a physical or cognitive activity related to the job/practice. The format of a task statement should always follow a subject/verb/object format, though it might be expanded to include qualifiers for how the task should be executed, the resources needed to do the task, or the context of its application. They also underscore that most task statements should have only one action and one object. There are some exceptions to this rule, but if there are multiple actions and objects, they typically should be split into different tasks. As a hint, they suggest critiquing any task statement that has the words “and” or “or” in it. I like this example because it is pretty specific, certainly better than just saying “determine vehicle’s speed.” It also provides a qualifier for how good their measurement needs to be (“approximate”). The context might be improved by adding more context (e.g., “using a tape measure”), but that might be understood by their participant population. Raymond and Neustel also caution researchers to avoid words that might have multiple meanings or vague meanings. For example, the verb “instruct” could mean many different things—the practitioner might be giving some on-the-fly guidance to an individual or teaching a multi-week lecture. Raymond and Neustel underscore the difficult balance of writing task statements at a level of granularity and specificity that is appropriate for accomplishing defined goals in the workplace, but at a high enough level that we do not overwhelm the JTA participants with minutiae. The authors also advise that we avoid writing task statements that describe best practice or that might otherwise yield a biased positive response. Early in my career, I observed a JTA SME meeting for an entry-level credential in the construction industry. In an attempt to condense the task list, the psychometrician on the project combined a bunch of seemingly related tasks into a single statement—something along the lines of “practitioners have an understanding of the causes of global warming.” This is not a task statement; it is a knowledge statement, and it would be better suited for a blueprint. It is also not very specific. But most important, it yielded a biased response from the JTA survey sample. This vague statement had the words “global warming” in it, which many would agree is a pretty serious issue, so respondents ranked it as of very high importance. The impact was that this task statement heavily influenced the topic weighting of the blueprint, but when it came time to develop the content, there was not much that could be written. Item writers were stuck having to write dozens of items for a vague yet somehow very important topic. They ended up churning out loads of questions about one of the few topics that were relevant to the practice: refrigerants. The end result was a general knowledge assessment with tons of questions about refrigerants. 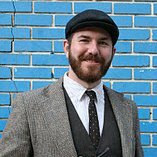 This experience taught me how a lack of specificity and the phrasing of task statements can undermine the entire content validity argument for an assessment’s results. If you are new to JTA studies, it is worth mentioning that a JTA can sometimes turn into a significant undertaking. I attended one of Mark Raymond’s seminars earlier this year, and he observed anecdotally that he has had JTA studies take anywhere from three months to over a year. There are many psychometricians who specialize in JTA studies, and it may be helpful to work with them for some aspects of the project, especially when conducting a JTA for the first time. However, even if we use a psychometric consultant to conduct or analyze the JTA, learning about the process can make us better-informed consumers and allow us to handle some of work internally, potentially saving time and money. 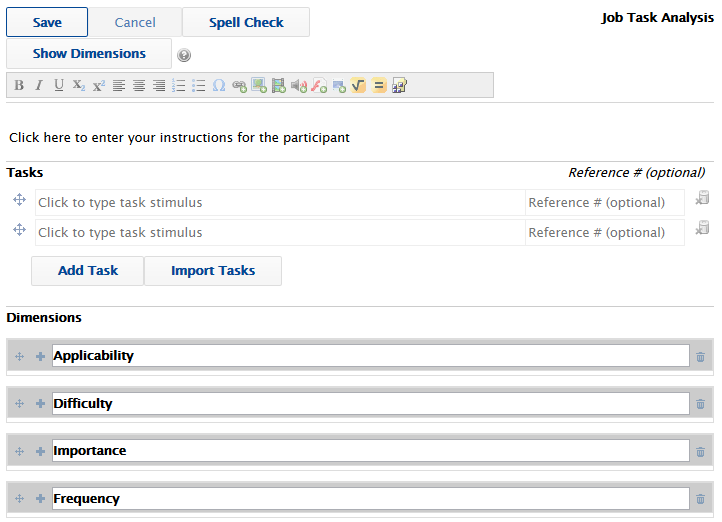 Example of task input screen for a JTA item in Questionmark Authoring.